I'm a proud owner of an Atari 5200 Advanced Video Entertainment System. One of the largest and rarest Atari home video game systems ever! This giant great game system has a strong 8-bit CPU processor system like the Atari 7800 (it was actually based on the Atari 400 computer) and my Atari 5200 even has 4 controller ports in front of the machine like the Sega Dreamcast and N64 have (only the early 5200 models did this though because only Super Break Out used the four player feature). The Atari 5200 Super System had all the makings of the next big console, but there is a sad story behind it. Atari needed a powerful successor to the aging Atari 2600 VCS, but chose to focus on their old warhorse instead of their newer 5200 technology, and by 1983 it was beginning to cost them. Since the Atari 2600 was sinking so fast and Atari itself was falling apart, the 5200 was all but ignored and the system faded into obscurity. Despite the potential the 5200 had, it never got a chance to shine. There was another big problem with the 5200. It's true what they say about the controllers- THEY SUCKED! The new analog controller sticks did not re-center after being pushed and believe me, it made for a lot of accidental deaths in some of the arcade style games the system is known for. If that wasn't bad enough they were also infamous for breaking down thanks to how sensitive they were. It wasn't all bad though, because these controllers also included some very revolutionary and cool features like Pause, 12 Number, and Reset buttons, so it wasn't a complete total loss I guess. The poor system never sold too well for Atari and the 5200 was ultimately killed off in July 1984 by the Great Video Game Market Crash since the demand for over hyped 2600 games like Pac Man and E.T. were very disappointing to say the least. There were tons of unreleased games for the Atari 5200 products like Asteroids, Pac Man Jr. Tempest, and many others that were killed off simply because of poor software sales compared to the Atari 2600 games but again that was Atari's fault for really not doing anything to advertise the machine. That brings me to another problem with the 5200; it was NOT backward compatible with the successful 2600 games (kind of like some Nintendo system consoles). A special adapter was released in 1983 but it was too late to really make a real impact (the ColecoVision even had a 2600 adapter and Coleco was an Atari rival). The Atari 5200 Super System is an awesome system for collectors because there are some real obscure but fun games for it like Return of the Jedi, Bounty Bob Strikes Back, and Gremlins, plus you can also find a lot of cool arcade legends like Ms. Pac Man, Qix, Pole Position, and Space Invaders to satisfy that need for intense retro action. Although there are some fun games here, the system is not very good for young kids or the casual player thanks to the awkward controllers and overall lack of software. 5200 Rating: 33/100 It has a good list of old arcade titles but the odd controller hurts this overall score. Find the Atari 5200 on eBay here! Rare Scale: 5/10 it only lasted two rocky years so it is one of the rarest Atari systems around. 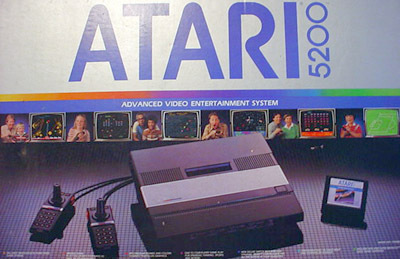 *the 5200 is actually the Atari 400 computer in a game console and the 5200 games look way better than the 2600 games. *there is an adapter to play 2600 games on the 5200.